Get your kids to put down their video games and introduce them to the joy of homemade bird feeders, the messier the better! The project of making bird feeders can be engaging and some of the ones described here are particularly gloppy and seem to delight most young children. Bird feeders near windows allow for indoor bird watching. They give opportunities for close-up observation and identification of different species of birds, as well as for studying bird behavior. When one jay aggressively chases another away, it may be a demonstration that the first jay is higher in the “peck order” than the second. Other dramas make the bird feeder an exciting place to watch. Materials: Pine cones, peanut butter, birdseed, string, plastic disposable-type bowls, hole puncher, bird pudding*, spoons. 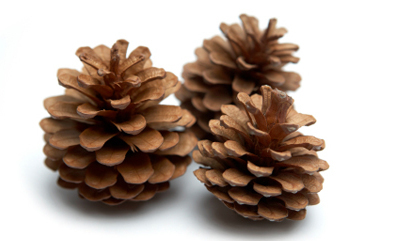 Procedure: Have the children make pine cone feeders by smooshing peanut butter with spoons onto the pine cones. Then roll the cone in birdseed, tie a string to the top end, and it is ready to hang outside. To make a bowl feeder, punch three holes evenly spaced around the top edge of the plastic bowl, fill the bowl with bird pudding (recipe below), and tie strings through the holes for hanging. Even 3-, 4-, and 5-year olds enjoy making these winter treats for the birds, with some assistance from adults. Use your imagination for other easy ones suitable for young children. For instance, try using empty grapefruit or orange halves instead of bowls. Recycle an old Christmas tree for bird use by standing it in the backyard. Hang simple feeders from its branches. Attach other items, such as stale doughnuts or sprigs from local shrubs and plants with berries or seed heads. String popcorn and cranberries together and drape the strings around the tree for an aesthetic effect and for edibility by the birds. Soften some bird pudding and smear it onto the branches. Add your own innovations, and your tree may become the gourmet bird restaurant of the area! Materials: One pound lard (or leftover cooking fat), one cup hot water, two cups oatmeal, one cup flour, four cups wild birdseed, large pan, mixing spoons. Procedure: Soften the lard or fat over warm heat in the large pan. Add remaining ingredients and mix well. Bird pudding can be slathered into any kind of container-type feeder. Adapted from Nature with Children of All Ages, by Edith A. Sisson (The Massachusetts Audubon Society, 1982).